There aren&apos;t a whole lot of ways to "go see" Russia. Viking River Cruises seemed like an ideal way to see some of this big country. We flew into St. Petersburg a few days early through Viking & were met at the airport and whisked away to our very nice hotel right downtown across the street from St. Isaac&apos;s Cathedral. We spent some time exploring the city on our own, then went on a Viking sponsored walking tour as well. Finally we checked out of our hotel and Viking collected our luggage and bussed us (and other Viking Passengers) out to where the Ship was moored. We spent a couple more days in St. Petersburg exploring more of the city and surrounding countryside. We did Viking Bus tours, Walking Tours, and even a boat tour seeing all of the major sites in and around the city. Our Guides were all very knowledgeable and professional and had unique access to a number of the sites. The ship has appx. 200 passengers on board. Our cabin was spacious enough so we could easily unpack all of our clothes and not worry about re-packing and moving as if staying in a hotel. Our room had all the amenities of a modern hotel. The ship was very clean and the staff super friendly. Most all meals were on board the Ship and were bountiful and tasty with a wide variety of food choices, including Russian and regional dishes. Both Ala Carte and Buffet dining options are available. The cost of all your meals and drinks with dinner are included in the cruise price. There is no assigned seating for meals, so we dined with many different interesting people. Other activities while on board include informational lectures about Russia, both historically & current times, and Russian Language lessons. Viking offers several onboard fun activities like Vodka Tasting too. There is plenty to do while on board: there is a small gift shop, a small library, of course a bar/lounge with musical entertainment, an open air deck topside with a covered area, and a second lounge area at the stern. The crew and staff work hard so you feel like a pampered guest, and they succeed. The ship stops every day to visit interesting places along the way with shore excursions. We stopped at two open air museums (Kizhi & Mandrogy) with buildings that had been brought in from various parts of Russia, these were often staffed with period correct craftspeople who could answer questions, as well as sell hand crafted items. We also stopped at a small city (Uglich) where we went on a walking tour and visited a local Russian couple in their home to talk of their life in Russia. And we visited a larger city (Yaroslavl) for a walking tour, a visit to the food & craft market and visits to other sites. We visited many religious sites (Russian Orthodox), Churches, Cathedrals and Monastaries. I was surprised by the amount of religious art, treasure and influence that has survived in Russia. There are also ample shopping opportunities along the way & your guides will let you know where you can get the bes deals. Finally it was on to Moscow for the finish of our trip. 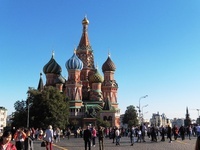 We spent several days in Moscow, again seeing all of the major sites through walking tours, bus tours, and a boat tour. The only downside in both St. Petersberg & Moscow is the ship docks are outside the cities a ways, so you will be in for daily bus rides of an hour to an hour and a half to get from the ship to the city centers. Overall on this trip I feel like we saw the best parts (and a wide variety) of Russia. Both St. Petersburg and Moscow are large cosmopolitian cities with lots of attractions to visit. The Russian people were friendly and open and honest with us. The open air museums give a sense of what life in the countryside was like, and it helped to visit smaller towns and cities to see what daily life in Russia is like. We went to many museums and palaces and religious sites. The guides of Viking are terrific and knowledgeable as are the site specific guides they use. This was a very enjoyable and easy trip and I would do it again. There aren&apos;t a whole lot of ways to "go see" Russia. Viking River Cruises seemed like an ideal way to see some of this big country. We flew into St. Petersburg a few days early through Viking & were met at the airport and whisked away to our very nice hotel right downtown across the street from St. Isaac&apos;s Cathedral. We spent some time exploring the city on our own, then went on a Viking sponsored walking tour as well. Finally we checked out of our hotel and Viking collected our luggage and bussed us (and other Viking Passengers) out to where the Ship was moored. We spent a couple more days in St. Petersburg exploring more of the city and surrounding countryside. We did Viking Bus tours, Walking Tours, and even a boat tour seeing all of the major sites in and around the city. Our Guides were all very knowledgeable and professional and had unique access to a number of the sites. The ship has appx. 200 passengers on board. Our cabin was spacious enough so we could easily unpack all of our clothes and not worry about re-packing and moving as if staying in a hotel. Our room had all the amenities of a modern hotel. The ship was very clean and the staff super friendly. Most all meals were on board the Ship and were bountiful and tasty with a wide variety of food choices, including Russian and regional dishes. Both Ala Carte and Buffet dining options are available. The cost of all your meals and drinks with dinner are included in the cruise price. There is no assigned seating for meals, so we dined with many different interesting people. Other activities while on board include informational lectures about Russia, both historically & current times, and Russian Language lessons. Viking offers several onboard fun activities like Vodka Tasting too. There is plenty to do while on board: there is a small gift shop, a small library, of course a bar/lounge with musical entertainment, an open air deck topside with a covered area, and a second lounge area at the stern. The crew and staff work hard so you feel like a pampered guest, and they succeed. The ship stops every day to visit interesting places along the way with shore excursions. We stopped at two open air museums (Kizhi & Mandrogy) with buildings that had been brought in from various parts of Russia, these were often staffed with period correct craftspeople who could answer questions, as well as sell hand crafted items. We also stopped at a small city (Uglich) where we went on a walking tour and visited a local Russian couple in their home to talk of their life in Russia. And we visited a larger city (Yaroslavl) for a walking tour, a visit to the food & craft market and visits to other sites. We visited many religious sites (Russian Orthodox), Churches, Cathedrals and Monastaries. I was surprised by the amount of religious art, treasure and influence that has survived in Russia. There are also ample shopping opportunities along the way & your guides will let you know where you can get the bes deals. Finally it was on to Moscow for the finish of our trip. We spent several days in Moscow, again seeing all of the major sites through walking tours, bus tours, and a boat tour. 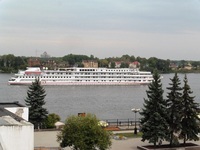 The only downside in both St. Petersberg & Moscow is the ship docks are outside the cities a ways, so you will be in for daily bus rides of an hour to an hour and a half to get from the ship to the city centers. Overall on this trip I feel like we saw the best parts (and a wide variety) of Russia. Both St. Petersburg and Moscow are large cosmopolitian cities with lots of attractions to visit. The Russian people were friendly and open and honest with us. The open air museums give a sense of what life in the countryside was like, and it helped to visit smaller towns and cities to see what daily life in Russia is like. We went to many museums and palaces and religious sites. The guides of Viking are terrific and knowledgeable as are the site specific guides they use. This was a very enjoyable and easy trip and I would do it again.